Is Cabot Oil & Gas Corporation (NYSE:COG) a good place to invest some of your money right now? We can gain invaluable insight to help us answer that question by studying the investment trends of top investors, who employ world-class Ivy League graduates, who are given immense resources and industry contacts to put their financial expertise to work. The top picks of these firms have historically outperformed the market when we account for known risk factors, making them very valuable investment ideas. Cabot Oil & Gas Corporation (NYSE:COG) has seen an increase in hedge fund sentiment lately. 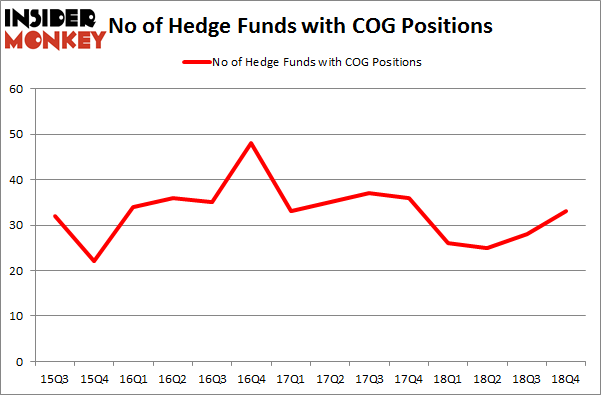 Our calculations also showed that COG isn’t among the 30 most popular stocks among hedge funds. Let’s review the key hedge fund action encompassing Cabot Oil & Gas Corporation (NYSE:COG). How are hedge funds trading Cabot Oil & Gas Corporation (NYSE:COG)? At Q4’s end, a total of 33 of the hedge funds tracked by Insider Monkey were bullish on this stock, a change of 18% from one quarter earlier. Below, you can check out the change in hedge fund sentiment towards COG over the last 14 quarters. So, let’s find out which hedge funds were among the top holders of the stock and which hedge funds were making big moves. The largest stake in Cabot Oil & Gas Corporation (NYSE:COG) was held by Stelliam Investment Management, which reported holding $243.4 million worth of stock at the end of September. It was followed by Millennium Management with a $201.2 million position. Other investors bullish on the company included Luminus Management, Citadel Investment Group, and Deep Basin Capital. With a general bullishness amongst the heavyweights, key hedge funds were leading the bulls’ herd. Deep Basin Capital, managed by Matt Smith, assembled the most outsized position in Cabot Oil & Gas Corporation (NYSE:COG). Deep Basin Capital had $56.3 million invested in the company at the end of the quarter. Robert Polak’s Anchor Bolt Capital also initiated a $47.5 million position during the quarter. 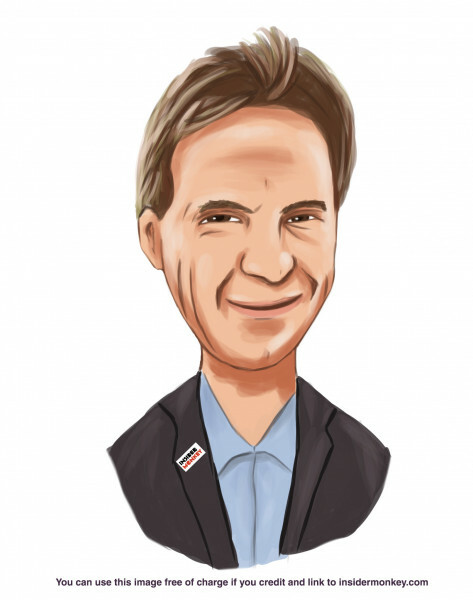 The other funds with brand new COG positions are Jeffrey Talpins’s Element Capital Management, Till Bechtolsheimer’s Arosa Capital Management, and Jed Nussdorf’s Soapstone Capital. Let’s go over hedge fund activity in other stocks – not necessarily in the same industry as Cabot Oil & Gas Corporation (NYSE:COG) but similarly valued. These stocks are The AES Corporation (NYSE:AES), Brookfield Infrastructure Partners L.P. (NYSE:BIP), Pinnacle West Capital Corporation (NYSE:PNW), and Fibria Celulose SA (NYSE:FBR). This group of stocks’ market values resemble COG’s market value. As you can see these stocks had an average of 16.5 hedge funds with bullish positions and the average amount invested in these stocks was $298 million. That figure was $895 million in COG’s case. The AES Corporation (NYSE:AES) is the most popular stock in this table. On the other hand Fibria Celulose SA (NYSE:FBR) is the least popular one with only 3 bullish hedge fund positions. Compared to these stocks Cabot Oil & Gas Corporation (NYSE:COG) is more popular among hedge funds. Considering that hedge funds are fond of this stock in relation to its market cap peers, it may be a good idea to analyze it in detail and potentially include it in your portfolio. Our calculations showed that top 15 most popular stocks among hedge funds returned 19.7% through March 15th and outperformed the S&P 500 ETF (SPY) by 6.6 percentage points. Hedge funds were also right about betting on COG, though not to the same extent, as the stock returned 16.3% and outperformed the market as well.